You and your friends decided to go on a nice long hike today, and it’s been a great trip. The weather was just perfect and the vistas were beautiful. Now it’s finally time to relax and enjoy the view from the top, but your friends immediately take out their cameras and phones and ask everyone to stand together. You know in a day that all of these pictures will be up on social media, and many of them will feature your crooked teeth. You’ve always been self-conscious about them, but you never could convince yourself that braces were right for you. They just seem like they’d be so uncomfortable, but what else can you do? Dr. Joshua Holcomb wants you to know that you can get the straighter smile you’ve always wanted with Invisalign in Collierville. For many years, the best way to straighten your teeth was with metal braces. This is because they are able to handle a wide array of orthodontic issues and are quite durable. However, one of the main drawbacks is that they overwhelmingly affect the one thing you are trying to improve: your appearance. The solution to this has been the invention of Invisalign. Rather than using unsightly brackets and wires, Invisalign uses clear plastic aligner trays to gently straighten your teeth. A series of trays is custom made for you, and each one is worn at a specific point in your treatment. You simply wear each aligner tray for about 22 hours a day for 2 weeks before progressing onto the next one. After you have worn them all, your smile will be completely straight. Appearance: Invisalign, as the name suggests, is nearly invisible when worn. You will probably be the only person who notices that you have a tray on, unlike with braces. Removable: The trays easily slide on and off of your teeth. This means you can take them out whenever you need to eat or brush your teeth, and this makes it much simpler for you to keep your teeth clean and saves you from having to drastically change your diet. Time: Not only can Invisalign straighten your teeth faster than braces, it also requires fewer visits to your dentist in Collierville to monitor your progress. This can save you a lot of time over the course of your treatment. Due to all of these advantages, this is why Invisalign is the choice of image conscious adults, teens, and celebrities alike. The first step to getting Invisalign is to visit Dr. Holcomb. 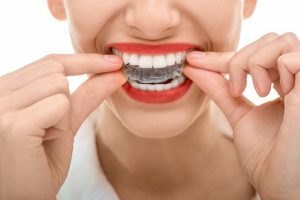 Invisalign is specially designed for each patient, which is why he will begin the process by taking a series of impressions, photos, and scans of your teeth. This will enable him to make sure that your trays fit comfortably and will guarantee the type of results you want. He will also show you how to put on the trays, as well as how to take care of them. After that, you only need to come to the office about once every 6 weeks to monitor your progress. Braces may have been effective in the past, but Invisalign is how people straighten their teeth now. It looks better, works faster, and is more comfortable than metal braces, which is why thousands of people choose it every day. If you want to get the straight smile you’ve always wanted, make an appointment with us today to get Invisalign.